Here is Monday’s lunch. Discovering the hasty nature of my life right now is meaning that I have just enough morning time to take a picture of lunch after assembling it, and then having to blog about it later. Hopefully shortly I will be Uber-Organised and able to keep everything on track. This was a lunch that worked for me. In the tupperware sandwich keeper is 2 tortilla wraps with mescalin, avocado, homemade falafels, hummus and beetroot. 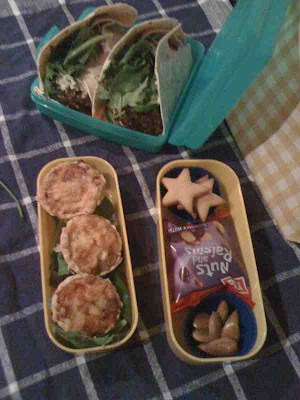 The bottom layer of the yellow bento has mini-quiche (made ahead and frozen on mass) and the top layer had a packet of nuts and raisins (LAZY), a mini-muffin container of almonds, and 3 star shaped ginger biscuits.